‘As I creative artist, I often get “stuck” and feel like I’ve run out of ideas. Some of the things I do to get “unstuck” is to look at the work of other artists, read inspirational books on creativity, or simply go to an unfamiliar place and soak up a new environment, perhaps taking photos without any intention of showing them to anyone but myself. To me, all these things are akin to keeping a journal, a journal of inspiration that I can turn to for ideas when I feel I’ve run out of them. The problem for me, is that most of the stuff that inspires me is found online in my daily perusal of various websites, blogs and social media. Even the books I read, I predominantly read on my iPad, so keeping everything together is not as easy as clipping an article or photo out of a magazine and pasting into a physical journal. So how do I keep all of this in one place? A place I can return to when I’m stuck and feeling like I need some fresh ideas? What I’ve started to do quite recently is to keep a digital journal of all the things I encounter online each day that catch my eye or spark my imagination in some way. This consists of anything that inspires me for any reason: A section of an article or book, a photograph or painting I see on someone’s blog or website, or something someone posted on Facebook. Sometimes I will encounter something while I’m waiting in line at the bank or grocery store – a color, a pattern, a snippet of conversation – and I might snap a quick photo with my iPhone or make a note with the Notes app. I don’t always know why something speaks to me, but I’ve learned to listen to my inner voice and trust that at some point in the future, I will use that spark to create something of my own. In my first Vision & Voice article for The App Whisperer, I suggested following your heart and seeking out those things that move you to grab your iPhone and start shooting. I recommended getting in touch with the things you love and urged you to start shooting those things. So fill your digital journal with things you love! Don’t worry about how they will find their way into your art, just trust that they will. So how exactly do you make a digital journal? Caption – I follow a blog called “Plenty of Color,” which I find to be very inspirational. Here is something I clipped and added to my digital journal for future reference. I liked the quote and I also liked the orange/pink color combo. I’m sure it will make its way into my work at some point in the future! 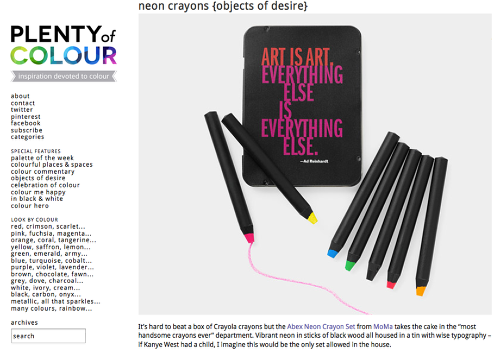 The crayons are pretty cool, too! On the computer: If you have a Mac, simply press these three keys at the same time: Command/Shift/4. This brings up a little crop icon, which you can then drag to highlight whatever it is on your computer screen that you want to capture. When you let go, you will hear a “click” that sounds like a camera shutter. A screen capture in the form of a JPEG will appear on your desktop. You can then name the screen capture and add it to a folder stored on your computer. On your iPhone or iPad: Simply press your Home Key and the Power Button (on the top right corner of your iPhone/iPad) at the same time. This takes a photo of whatever is on your screen at the time and saves it to your camera roll. From there, you can either create an album to store these screen captures on your device, or email them to yourself or access them via the Cloud on your computer and store them there. Without doubt we are inspired by others. And as long as its Not a replica of anothers vision but made into ones own…it does indeed become instructive. Like copying the masters to learn how to paint -see. Sometimes I wonder why one will have so many followers on their stream ..but so little interchange. I have often thought it to be for inspiration for oneself as opposed to a genuine appreciation for the others work. For a person who is not very assertive in self promotion…it can feel somewhat disheartening when another gets inspired by their vision – and gets recognition and applause — while one who served as the muse for their new direction remains incognito. I think if we are spurred in a particular direction by another…giving due credit when merited would be honorable . Perhaps I do say this because – I do get the impression there exist a set group of mobile artist who are considered and given due praise — while I have not -as of yet- recall any sites that are focused on discovering new and under appreciated mobile artist. True… numbers mean nothing when it comes to the mandatory likes of ones work– especially when one has indeed worked hard on developing their craft. But going back to the begin…I can’t help but wonder – how many folks with instaFame follow other creatives under the radar to exploit their ideas for self. This is just a question I have asked myself over n over again. You say you are not good at self promotion – maybe this is an area you need to work on – most of the folks who participate here and on other photo sites seem willing to share – just ask! Hi Tracy, thanks for the reply. I totally agree we should never be inspired for want of recognition. However, wouldn’t you agree that most of us share or expose ourselves for the want of such? One thing I am appreciative of within the cyber network of presenting ones work is having an audience. While my friends are supportive and encouraging, at times , when not a shared interest, it can be alittle one sided show and tell. Maybe that’s it : we are like children who create or discover something and find ourselves eager to go before the classroom and share it. It’s difficult for me to imagine standing before an audience of none. Hmmmm….sounds like a neat illustrative project. It’s all relative …isn’t it? Which sort of goes with the whole promotion of self… Not wanting to blow a trumpet for the vanity of it all…yet …. Too- please note- these thoughts expressed haven’t any real time weight attached to them. They are fleeting . Taking their place along with the more important things in life. I am often amused at human nature as well as that which reflects back at me. Do you share your vision anywhere? Not sure if I totally understand the quote. Does it mean creativity is emulating what one sees and doing so so well no connection to the source is perceived?